Has life returned to the sterling bond sector? Should investors stay put in 2011? Is there still value? During a period of strong performance from this sector, the Rathbone Ethical Bond Fund has benefitted from this trend, enjoying good relative performance, and remains first quartile over one and three years, and second quartile over five years (as art 28.04.2011). • The European debt crisis, what impact has this had? Find out how Bryn Jones is defending the fund against these issues. • As a highly thematic vehicle. Where opportunities are being found, and which target sectors are being favoured? 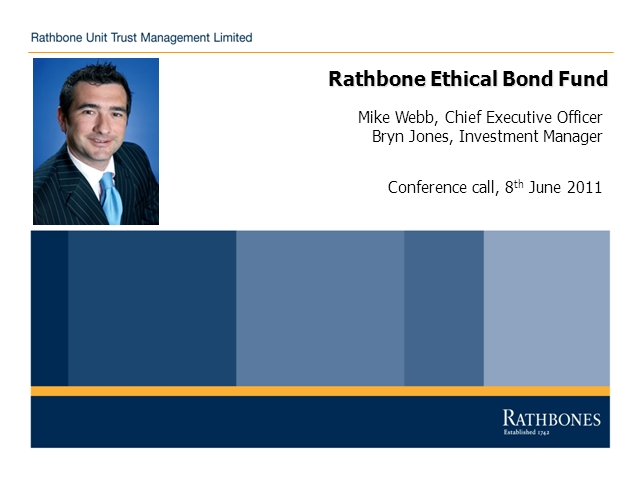 • Duration-management forms a key part of the strategy, what positions are being taken in the Rathbone Ethical Bond fund. • How will the manager be safeguarding the portfolio from higher inflation, and what prospects lie ahead in 2011?